Our attorneys have significant experience defending drivers against traffic ticket defense. We are lead by a former prosecutor and our experience spans over three decades. We have been recognized by our peers as some of the best lawyers in New York. If you have been issued a cell phone ticket or a texting while driving ticket, give us a call at 800-893-9645 and find out how we can help. What are the possible consequences of a conviction under the new change? New York has changed its long standing policy of not assessing points for a violation of its cell phone laws. Now, a conviction under VTL 1225 will result in 3 points being assessed against your license and a maximum possible fine of $250.00 plus surcharges being assessed. This in turn can have a significant impact your insurance and cause you to suffer thousands of dollars in insurance increases. (a) "Mobile telephone" shall mean the device used by subscribers and other users of wireless telephone service to access such service. (b) "Wireless telephone service" shall mean two-way real time voice telecommunications service that is interconnected to a public switched telephone network and is provided by a commercial mobile radio service, as such term is defined by 47 C.F.R. S 20.3. (c) "Using" shall mean holding a mobile telephone to, or in the immediate proximity of, the user's ear. (d) "Hand-held mobile telephone" shall mean a mobile telephone with which a user engages in a call using at least one hand. (e) "Hands-free mobile telephone" shall mean a mobile telephone that has an internal feature or function, or that is equipped with an attachment or addition, whether or not permanently part of such mobile telephone, by which a user engages in a call without the use of either hand, whether or not the use of either hand is necessary to activate, deactivate or initiate a function of such telephone. (f) "Engage in a call" shall mean talking into or listening on a hand-held mobile telephone, but shall not include holding a mobile telephone to activate, deactivate or initiate a function of such telephone. (g) "Immediate proximity" shall mean that distance as permits the operator of a mobile telephone to hear telecommunications transmitted over such mobile telephone, but shall not require physical contact with such operator's ear. 3. Subdivision two of this section shall not apply to (a) the use of a mobile telephone for the sole purpose of communicating with any of the following regarding an emergency situation: an emergency response operator; a hospital, physician's office or health clinic; an ambulance company or corps; a fire department, district or company; or a police department, (b) any of the following persons while in the performance of their official duties: a police officer or peace officer; a member of a fire department, district or company; or the operator of an authorized emergency vehicle as defined in section one hundred one of this chapter, or (c) the use of a hands-free mobile telephone. 3. Subdivision one of this section shall not apply to (a) the use of a portable electronic device for the sole purpose of communicating with any of the following regarding an emergency situation: an emergency response operator; a hospital; a physician's office or health clinic; an ambulance company or corps; a fire department, district or company; or a police department, (b) any of the following persons while in the performance of their official duties: a police officer or peace officer; a member of a fire department, district or company; or the operator of an authorized emergency vehicle as defined in section one hundred one of this chapter. 6. A violation of this section shall be a traffic infraction and shall be punishable by a fine of not more than one hundred fifty dollars. 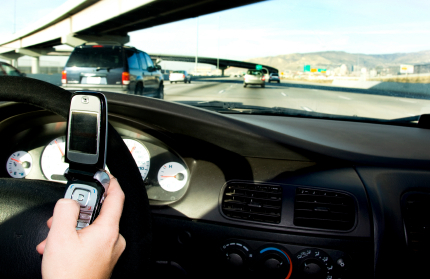 If you have been issued a cell phone ticket for either talking on the phone while driving or texting while driving, give our experienced traffic ticket lawyers a call at 800-893-9645. We have helped hundreds of motorist and excelled at getting tickets either dismissed ore reduced. Our attorneys can often be found fighting ticket matters in Westchester County, Rockland County, and Orange County. Some of our regular courts of appearance include , Ramapo, South Nyack, Stony Point, Dobbs Ferry Village Court, Yonkers City Court, Harrison Town Court, Rye Town, Wawayanda Town Court, Rye City Court, New Castle Justice Court, and Bedford Town Court. We also fight criminal charges.